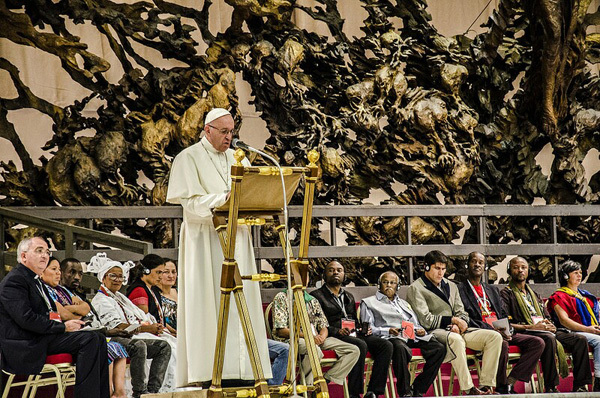 On November 5, 2016, Pope Bergoglio addressed the Popular Movements, above, whose III International Meeting was hosted by the Vatican. In his speech, he encouraged the Popular Movements to fight against "the ideological colonialism that seeks to impose supra-cultural recipes that do not respect the identity of peoples." Then, he went on to identify this colonialism: "There are powerful forces that try to neutralize this process of maturation of a change capable of displacing the primacy of money and to place the human being at the center." Next, he stated: "There is a basic terrorism that stems from the global control of money and attempts against the whole of humanity. This basic terrorism fuels the other derived terrorisms, such as drug terrorism, State terrorism and what some erroneously call ethnic or religious terrorism. But no people, no religion is terrorist. ... The whole social doctrine of the Church and the teachings of my predecessors rebel against the idol of money that reigns instead of serving; it oppresses and terrorizes humanity." He ended by telling the Popular Movements that they are the hope to correct this situation and also the crisis of the democratic system: "You, the organizations of the excluded and so many organizations of other sectors of society, are called to revitalize and re-found the democracies that are passing by a real crisis." The leaders Francis trusts for this task, whom he greeted at the end of his talk, were José Mujica, ex-president of Uruguay and ex-terrorist, first row below, as well José Pedro Stédile, second row below, leader of the Landless Movement in Brazil (MST), also a communist movement. To show our readers who these man are, we place pictures of them speaking in public under the aegis of Che Guevara, third and fourth rows. The Landless Movement in Brazil is a violent group of rural guerillas, which invades and occupies farms all over the countryside, fifth and sixth rows. The twin brother of MST is the Workers Party (PT), which also promotes violent acts in the cities. From the seventh row to the last row, we present some expressive photos of how the PT acts when it meets any opposition. 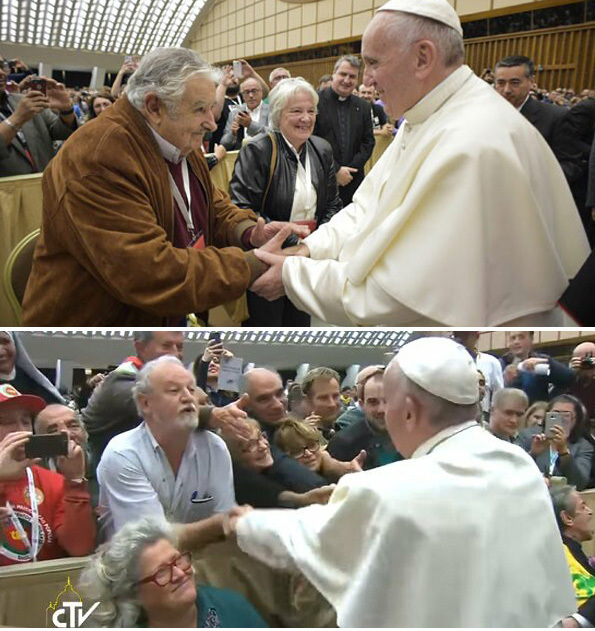 These are the men and the movements Pope Francis is assigning the task of reforming present day society and preparing for the future. Is he not the greatest promoter of Communism we have in the world today?